This two-reel silent comedy, presented by Century Comedies and released 21 April 1925 by Universal Pictures Corporation, is one of many collaborations between William Watson (who is credited with Writing and Directing it) and Edna Marian (who is credited with Playing Eva, Topsy and Liza). When the film opens, however, Marian is playing Dolly, "a heart breaker who brought more men to their knees than a flat tire," in a sophisticated bedroom farce. That film, however, turns out to be the daydream of an unnamed farmer's daughter (Edna Marian again), who is fantasizing about a career in the movies until her father reminds her that the cow needs milking. Even as she milks the cow, however, a film company under the direction of "Cecil de Milo" arrives to shoot Uncle Tom's Cabin on the farm, and soon (the whole movie is only 22 minutes long) the farmer's daughter is in pictures. The five clips below feature the four scenes from Stowe's novel that we watch the company filming: Tom's sale to Legree, Eva's death and ascension to heaven, Eliza crossing the ice. Although de Milo is making a tear-jerker, Watson and Marian milk all of them, even Eva's death, for humor. Curiously, the order in which the scenes are shot is exactly backwards, perhaps to signal the way the film deconstructs Stowe's popular text. If so, it may be equally significant that in Watson's last scene, we see de Milo's movie completely destroyed. 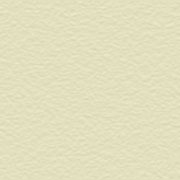 No cast members besides Marian are named. It's obvious that "Tom" is a white man in blackface, but at least some of the other "slaves" seem to be played by African Americans. Edna Marian is the farmer's daughter, and a fascinated spectator, when the company shoots the slave auction. 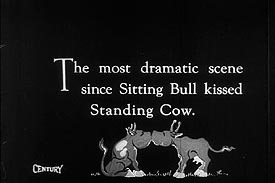 The words "spoken" by the characters in the film within the film suggest how the lines that were Tom Show staples were translated into Twenties slang. Under these cultural layerings it's still possible to hear Stowe's original creations. Just after this scene the director learns his leading lady has quit to join the "Sears Roebuck company" — and Edna gets her chance to be a movie star. As the shooting works its way back toward the start of Stowe's story, Edna will play Eva, Topsy, Eva again and Eliza, in that order. This clip is about one third of the deathbed scene, in which the tears shed by humans and horses are meant to make movie-goers laugh. 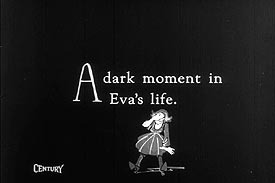 Watching Eva turn into Topsy may have made audiences think of the Topsy-Eva dolls that were familiar playthings at the time. Watching Edna Marian trying to be "black" with her eyes and mouth as soon as the mask goes on provides a graphic depiction of a stereotype in action. As Eva again, the farmer's daughter follows the upward path of so many other earlier Eva's, but like a number of other modern re-presentations, this one ends by replacing the idea of a supernatural soul with the fact of an earthly body. In another sequence, the special effect at first has Eva flying downward after death — until the director reminds the crew that "she's a good girl." This clip is a composite of three different parts of Eliza's flight across the ice, as this company enacts it. Omitted are lots more "bronchitis flakes" of snow being tossed around, and a series of gags about the "bloodhounds" (predictably, an ill-assorted bunch of mutts). This is Marian's last performance as one of Stowe's characters. The movie's final gag shows her ruining the film they've shot by exposing it to the light, as she tries to get a look at her performance. 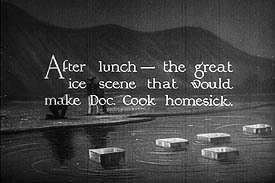 Archival film from the collections of the Library of Congress.